The US sanctions on Iran's energy industry, when it would come into effect on November 5, could potentially spike the petrol, diesel and LPG prices in India. The Indian oil refiners buy Iranian crude at $3-5 a barrel discount to the other crude grades in the Middle East. The benefits include the $2-4 discount for a barrel of crude; $1 a barrel freight subsidies; and the extended payment facilities, say industry experts. The $5 increase in landed cost of crude will translate into around Rs 2 change in petrol and diesel prices in India. 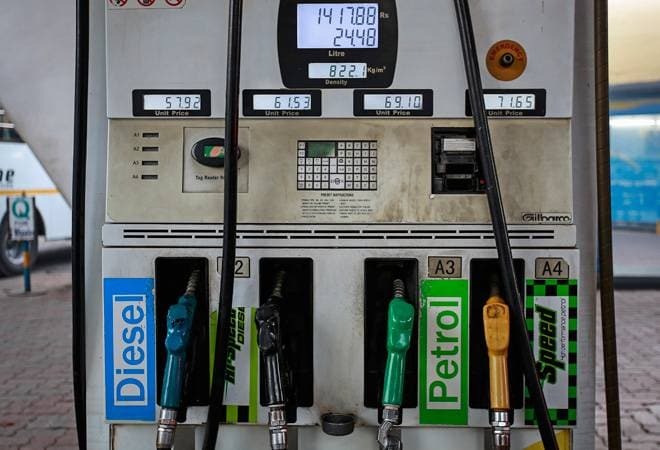 The price of petrol stands at over Rs 91 a litre in Mumbai, close to the century-mark, and diesel near Rs 80. According to Bloomberg tanker tracking data, India is the second-largest buyer of Iranian oil and imported an average of 577,000 barrels a day this year, or about 27 per cent of the exports from Middle Eastern countries. Another metric is that India sources about 14 per cent of its imports from Iran. The crude refiners --- Reliance Industries, Essar Oil (now Nayara Energy), Indian Oil, HPCL, BPCL and MRPL, haven't placed any order for the Iranian crude in November, say corporate sources. "The US sanctions will definitely affect the margins of the companies if the end-product price doesn't move up. For instance, the price of Brent crude is $85 now and petroleum and petrochemical products are priced at the listed crude cost, not at the discounted rate. Most of the Indian refiners use around 20 per cent crude imported from Iran because of the cost benefits." Reliance had reported a gross refining margin (GRM) of $10.5 a barrel in the first quarter of this financial year, compared to the Singapore margin of $6. Excluding the inventory gain, the GRM of Indian Oil stood at $5.18 per barrel. HPCL reported an adjusted GRM of $3.72, while BPCL's GRM stood at $7.49. "There are three factors affecting the GRM --- landed cost of crude, operational efficiency and price of the final product. The refiner has control over only one thing, its efficiency," say sources. The refining companies are having a tough time, and are heavily hedging their crude price and currency positions. Brent crude is now at four-year high levels on worries that global crude supplies will drop due to Washington's sanctions on Iran. The experts predict the price would shoot up to $100 per barrel. India meets 80 per cent of its petroleum demands through imports, largely from Saudi Arabia, Iraq and UAE, besides Iran. Recently, the country started importing crude from Russia and even the US. The high dependency on the imported crude has worsened India's macro position. A $10 per barrel change in the crude price results in 50 basis points impact on the current account deficit (CAD) and 30 basis points impact on inflation, said Kotak Institutional Equities in an August report. The crude has a modest impact on gross fiscal deficit because of the continuing subsidies on kerosene and LPG. The fiscal deficit would further widen if the government succumbs to the political pressure and reduces taxes on diesel and petrol. According to Motilal Oswal Financial Services, "Rupee continued to remain under pressure and today hit fresh record low levels following sharp surge in global crude oil prices." The rupee plunged to a fresh record low on Wednesday and opened 34 paise down at 73.25 against dollar. Cutting off Iranian supplies entirely would push oil prices above $100 per barrel because other major producers could not easily fill the void, predicted Fereidun Fesharaki, founder and chairman of consultancy FACTS Global Energy. Mercuria Energy Group and Trafigura Group, among the world's biggest trading houses, are predicting the loss of Iran's supply will boost prices to $100 a barrel for the first time since 2014. BP Plc Chief Executive Officer Bob Dudley echoed the sentiment. The sanctions on Iran are going have a bigger impact on the market this time than the previous round of restrictions six years ago, he said. In previous sanctions under Barack Obama in 2012-2015, Indian government was allowed to continue purchases from Iran at reduced levels. India had approached the US for the similar waivers, but the Trump administration is taking a harder stance.